Nickname: "La Saeta Rubia" ("The blond arrow") | "Don Alfredo"
Unquestionably one of the greatest players ever to play the game, Alfredo Di Stéfano achieved phenomenal success as a player first in South America and later in Spain although a variety of circumstances prevented him from ever appearing in the World Cup. He was blessed with a wide range of talents and could play in a variety of positions with equal skill, leading a number of his contemporaries to view him as the most complete player of all time. Di Stéfano was born in the Barracas district of Buenos Aires on 4 July 1926, into a family of Italian migrants. His father was a fanatical River Plate supporter and it was from that influence that his interest in football developed, as he grew up kicking a rubber ball around the streets near his home. He played for various local youth teams before being invited for a trial at River Plate in 1943, where he was quickly signed on and given a place in the club's youth system. Di Stéfano broke into the first team at River for the first time during the title-winning season of 1945, but the club's established 'La Máquina' (the machine) forward line meant that his opportunities were initially limited. He was sent out on loan to Huracán in 1946 and his performances earned him a regular place in River Plate's team when he returned the following year. In the 1947 season Di Stéfano scored 27 goals to finish as the league's leading scorer, helping River to regain the league title they had lost a year earlier. Later that year Di Stéfano was selected for Argentina for the first time, at the South American Championship in Ecuador. He scored six goals in six games, including a hat-trick against Colombia, as Argentina took the title. No-one could have imagined that he would never play for Argentina again, but a players' strike in 1949 led to a number of leading stars leaving the country. Many went to Colombia as that country was not a member of FIFA and playing restrictions were more relaxed, with Di Stéfano joining Millonarios of Bogota. His playing career in Argentina was over at the age of 22. In four years with Millonarios, Di Stéfano won three league titles and one Copa Colombia, as well as being the league's leading scorer in both 1951 and 1952. He also represented the Colombian league in four unofficial 'international' matches. His performances attracted the attention of clubs across the world, in particular, both Real Madrid and Barcelona. The process by which he came to play in Europe proved to be highly controversial, as both River Plate and Millonarios had claims to his registration. Barcelona seemed to seal a deal to sign Di Stéfano from River Plate but the Spanish federation insisted that Millonarios had to agree as well, which they did not. Real president Santiago Bernabeu saw his chance and made a counter-offer. In an attempt to resolve the situation, a deal was proposed where Di Stéfano would move to Spain on a four year deal and play two seasons for each club, but with their fans opposed to the idea Barcelona eventually withdrew and Real secured his signature in 1953. It was with Real that Di Stéfano became recognised as one of the finest players in the world. As in Argentina, he was a prolific goalscorer and nominally played as a centre-forward but moved far deeper than many others in that role. His speed, stamina and versatility made him one of the players to fulfil the role of the modern 'box-to-box' midfielder. He was able to track back and help out the defence, start a counter attack and then get upfield into a goalscoring position himself. In his first season at Real, Di Stéfano scored 27 league goals, the most in the league, to lead the club to a first title in 21 years. Spain wanted to call him up for the national team, but FIFA refused because he had represented Argentina and Colombia previously, a decision which was not reversed until 1957. Nevertheless Di Stéfano helped to establish Real as the dominant force in European football throughout the 1950s. Another league title was won in 1955, qualifying Real for the first ever European Cup. They reached the final against French side Stade de Reims, where after trailing 2-0 it was Di Stéfano's goal that began a fightback which would eventually result in a 4-3 victory. That win began a run of five consecutive European Cups for Real, with Di Stéfano scoring in all five finals including three in the 7-3 thrashing of Eintracht Frankfurt in 1960. He was named European Footballer of the Year in both 1957 and 1959 and finished as top scorer in the Primera División five times in six years, helping Real to two more league titles. His partnership with Hungarian Ferenc Puskás, who scored the other four goals in that 1960 European Cup final, became one of the most legendary in the history of football. Between them they led Real to a 5-1 win over Peñarol of Uruguay in the 1960 Intercontinental Cup, emphasising their status as the best in the world. Although they would not win another European title in Di Stéfano's time, they did go on a run of four league titles in a row in the early 1960s to complete a run of eight in eleven years and also won the Spanish Cup in 1962. One of the most famous sportsmen in the world, Di Stéfano went through an incredibly frightening experience in 1963 when he was kidnapped while appearing for Real in a friendly tournament in Venezuela. Initially he feared for his life, but was released unharmed two days later and subsequently revealed that his captors had treated him well, having been seeking only publicity rather than a ransom. 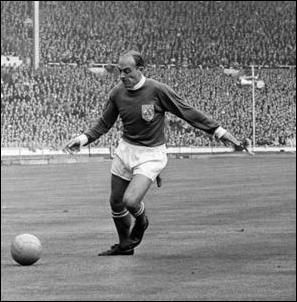 Despite domestic success with Real, Di Stéfano's career was marked by frustration at international level. Having finally been allowed to play for Spain in January 1957 he appeared in qualifying for the 1958 World Cup, but Spain struggled in their early matches and ultimately finished a point behind Scotland, failing to reach the finals in Sweden. Four years later, he scored the clinching goal in a play-off against Morocco that took Spain to the 1962 finals in Chile but suffered an injury just before the tournament, ruling him out of the competition and ending his last chance of appearing in the World Cup. In 1964 Di Stéfano left Real after eleven seasons, having scored 307 goals in 396 competitive games for the club. His final game came in the European Cup final against Internazionale, which Real lost 3-1. He moved to Espanyol, where he played two more years before ending his playing career at the age of 40. After his retirement, Di Stéfano moved into management where he experienced considerably more success than many of the game's other leading players have been able to achieve. Di Stéfano won league titles in Boca Juniors in 1969, Valencia in 1971 and River Plate in 1981. He also won the European Cup Winners' Cup during a second spell with Valencia in 1980. In 1982 he became manager of Real Madrid, but his time in charge was marked by incredible frustration with Real finishing as runners-up in all five competitions that they entered in 1982-83. After brief returns to Boca and Valencia, Di Stéfano's final managerial job was a second brief spell in charge of Real as caretaker manager in 1990-91. He remains one of football's most legendary figures and since 2000 has been honourary club president at Real. How reliable that second set is? As far as I can tell the only full games available from him are from Real Madrid. Very sad to hear the news that this football legend died, R.I.P. Don Alfredo. Operating as a deep-lying centre-forward, di Stefano exercised an all-pervading influence, an imperious general directing his forces with more than a dash of arrogance. But his personal example was invariably so radiant, his strategy so fiendishly astute, that it was a rare comrade who cavilled at his authority. In matters of technique he was well-nigh perfect; his control was sleek and deft, he was a master of the sudden sidestep, his passing was precise and perceptive, his shooting savage or subtle according to need. Usually he was not one for the mazy dribble; he would keep the ball, watching opponents as a cat might eye an appealing rodent, waiting for the precise moment to dispatch his delivery to maximum effect, often with uncanny intuition. His most productive partnerships were with exceptional movers off the ball, the likes of Real colleagues Ferenc Puskas and Francisco Gento, rather than with fellow strategists such as the gifted Brazilian, Didi. His physical attributes were as exceptional as his technical assets. There was searing acceleration from a standing start, the strength to withstand the abrasive challenges to which he was subjected, and the capacity to maintain a punishing work-rate, his boundless stamina having been generated initially by pounding the streets of his native Buenos Aires with obsessive dedication. In addition, and no less important, he possessed a ferocious rage to win, so intense that he could not bear to be bested even at the card table. He was a box-to-box phenomenon, a multi-skilled schemer and scorer with a hand in every phase of play, harrying opponents by chasing back into defence, beguiling them with his midfield creativity or destroying them at the vanguard of the attack. As Miguel Muñoz, his team-mate and then coach in Madrid, put it: "With him in the side, you had two players in every position." I don't know if DEF 75 is truly deserved. In the early sets he had 65 and then (I think it was from PES 6), Konami increased it to 75. The more I see him, the more I feel 65 is the right value...It's true he was everywhere and was committed to defend but from what I have seen from him, he wasn't skillful enough in that aspect to deserve a green value, he used to make some avoidable fouls while harassing the opponents for the ball for example. Anyway I don't have solid arguments on this as it's more a matter of perception but I wanted to raise the question. I'm with you, for me he doesn't deserve 75, but I have my doubts about low it 10 points... 65 it's a high value for an offensive player but Di Stéfano I think could be in 70 or even 71, at least in my PES 6 where I have classic teams created and these things, I have him with 71 and I think it suits him very well. When you look at the DEF value of some offensive modern players who defend significantly like Rooney for example, they are around 65 that's why it makes much more sense to me to have Di Stéfano around that value (I'm not saying Rooney = Di Stéfano but it's better to benchmark with actual players in attributes where they have some "similarities" to not overrate classics). I'd say I would give max 68 in def, the same value that Konami gave to Gullit for example as I don't think Di Stéfano is so much superior to Gullit (talking about 2 all-arounders) in terms of DEF. So...how about the def value? Personally, i agree with you about lowered it to around 68.